This is a very nice, contemporary fixture. I also got the ceiling-mount version for the front entry hall. Well made, well packed, arrived on time & damage free. I would recommend this item. Safavieh Lighting 20-inch Adjustable 4-Light Greta Veil Gold Pendant Lamp - 19.75" x 19.75 " x 9-45"
Safavieh Lighting 9.6-inch 3-light Greta Veil Gold Ceiling Light - 15.75" x 15.75 " x 9.625"
Safavieh Lighting 21-inch Adjustable 5-Light Orb Drum Gold Pendant Lamp - 21" x 21" x 9.875-45.875"
A modern double drum shade fixture, the Greta Veil pendant uniquely pairs a white etched glass inner shade with an outer shell of meshed steel in an antique gold finish. This elegant transitional fixture casts an elegant glow in any room it inhabits. Dimensions 43.25 in. H. x 19.75 in. 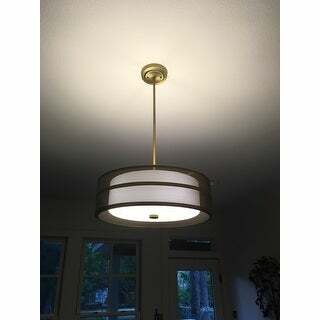 W. x 19.75 in D.
This fixture looks so much more luxurious than its price! We bought it for our Midcentury Modern home because it has elements of that era but still looks modern. The brass finish is perfect … not too brassy and not too bronzey. A nice subdued brass color. The enclosed shade is gorgeous, and it creates a soft glow without glare. Installation was easy. It works on our slanted ceiling. This fixture just didn't hit the mark for me. Recently, I have replaced my cabinet hardware and light fixtures with rubbed gold/brass ones. Compared to others this fixture has a very dull patina. It is technically gold, but lacks the warmth of my other hardware. 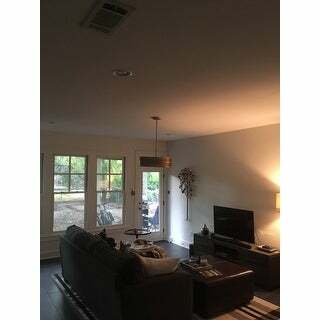 The fixture doesn't feel or look as substantial as I had hoped for a large room with 11' ceilings. It would have worked much better in apartment sized space. It came with 3 adjustable rods so you have 3 choices in length/height. The plastic inside is just ok, I may change the bulbs it came with to give a warmer ambiance. I did not see the silver/nickle on the inside of the perforated drum as others have reported. I will replace this lamp once I find a suitable fixture for my space. This pendant was exactly what I was searching for. I wanted a streamlined contemporary flair but still a warm look. This unique finish gave me exactly what I needed. I have already received many compliments on it. Love this light. Easy to hang, looks great, and gives off more light than our old light. Beautiful light. Compliments nearly any style. 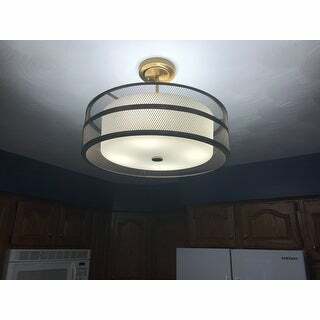 Receive constant compliments on light fixture. Looks beautiful in my living room. Gold is not too dull or too shiny, just right. We installed this light in our office and it looks beautiful. This fixture is gorgeous and looks much more expensive than the price. We used it in our dining room on the shorter side which is not flush with the ceiling, but hangs down a few inches. Gives off very mid-century modern vibes without being too busy. Changed out "builder" fixtures in hallway with 2 of these lights - WOW, what a difference! Quality MUCH better than expected and comes with LED bulbs - they look great! This fixture had a rougher look to it than pictured. It is not completely "gold" but shows quite a bit of aluminum (grey) inside the punch holes and alongside the rough edges of the metal work. I did end up keeping it, because I needed an inexpensive "brass" pendant fixture. However, once I have more money in my budget, it will be replace, since it looks inexpensive. Looks almost exactly as pictured. As other reviewers have said - the color in person looks a more "painted on." Overall it looks luxurious, and I'd buy it again. Was super easy to install. Came quickly and as described. "Can this fixture be installed without the rod?" This light fixture has an adjustable rod length. "Can you guys contact Safavieh to see if this is dimmable?? THX!!!" "Can I put LED bulbs in this lamp? If so, can I use 100w LED bulbs? Thanks, Minane"
The finish and the fact that the inside shade is not fabric. Need a kitchen like that gives greT light but isn’t a focal point. "can I shorten the rod? My ceiling is low TY Trina"
Hello sistat, the rod is not adjustable. Thanks for shopping with us! "What is the height of the actual light pendant without the hanging rod?" Hello chris, the shade is approximately 5 inches high. Thanks for shopping with us! "is the pendant rod fix? or will it move? I have a sloped ceiling." Hello chauvina, the pendant has a fixed rod. It is not suitable for sloped ceilings. However, an electrician can modify it by installing a sloped ceiling canopy kit. I hope this info helps. Thanks for shopping with us! 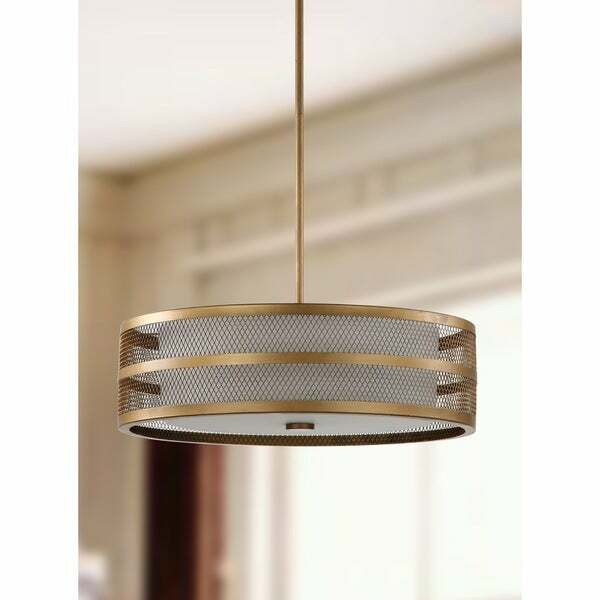 Safavieh Lighting 18-inch Adjustable 3-Light Giotta Gold Drum Pendant Lamp - 18" x 18" x 9.25 - 45.25"
Safavieh Lighting 10.25-inches 3-light Orb Gold Ceiling Light - 17.125" x 17.125" x 10.25"
Safavieh Lighting 21.5-inch Silas Gold Adjustable Pendant Lamp - 21.5" x 21.5" x 17-89"